It is awards season and the envelope is a major player. 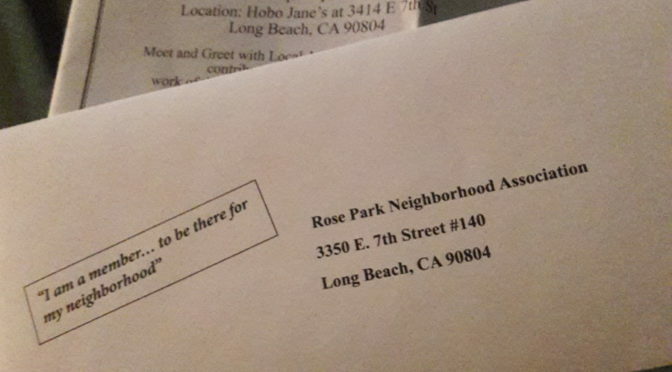 For the Rose Park Neighborhood Association the envelope is a way to support its efforts. You might have noticed an addressed envelope tucked into February’s door to door newsletter. Membership is $25 for the year, but donations of any size are welcomed and acknowledged! Include your email. Next up on our calendar will be the Eggstravaganza – the spring egg action in Rose Park (8th & Orizaba). On Sunday March 25 from 10-noon. A truly great way to spend quality time with the family – FREE and all are welcome. We are pleased to – once again – be the beneficiary from Shannon Jones, Realtor who is our event sponsor AND brings baked goods and fun activities to the experience. We’ll also have the quintessential photo booth (read Facebook here), arts and crafts tables, egg races plus non-partisan voter registration (for those folks who are sitting their coffee and like to spend their time wisely) and “Speed Reader” the LB Public Library’s mobile library on a Trike. Also in March will be our now annual Moms for a Beautiful 10th St effort which will be held at a bus stop with a focus on safety with those use the street and again decorate the 10th St. trees. And a Indie Meet-up discussion on Being Temporary. This planning is in progress. PLEASE email info@rpna.org for up-to-date information.